By definition, inactive records are no longer needed on a daily or weekly basis. Once they have reached the inactive stage, you must decide where these records will be stored. For many, the solution is one of the following: an empty office or offices, the manufacturing floor or warehouse, a basement or attic, a self storage unit, or even an abandoned building. For many reasons, these seem like attractive options. After all, the files are inactive and the space is already there. However, you should ask yourselves some questions about these facilities. Are records stored in basements near water pipes that may be prone to flooding? Are they stored in damp areas that lead to mold and mildew and the eventual destruction of the contents? Are the records protected against fire in any way? Even when you theoretically have space for your records storage, retrieving needed files can be difficult. In other areas, we will discuss how your storage solution defines the accessibility, security, control, and cost of your records management solution. Additionally, space, as a records management issue, often comes down to the simple fact that you have records you need to retain, and you have no place to put them. Renting a self-storage unit often times seems like the only solution, even if you lose control and accessibility of your records. AS you will see under the other reasons for a commercial records management program, self-storage should only be a solution if you do not have a company like Records Management Service available. Records Management Services can help you solve your space issues. Our records center is designed to store records in the least expensive way possible, while still maintaining accessibility and protecting your records from unauthorized access. The cost of maintaining records like this is $23.10 per cubic foot annually. 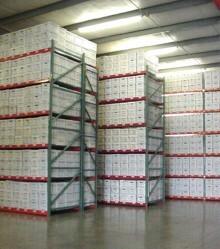 We can lower the cost of storing and maintaining records dramatically. Would you like to learn more? Email us for more info. ** "Why Records Management." from Professional Records & Information Services Management (PRISM) International, a not-for-profit trade association providing education, networking and advocacy services to their members and the business public.